An accounting professional is the secret weapon for faster growth of any company. Sketching a clear picture of finances and cash flow is an intimidating task for most business owners as it requires vast accounting knowledge, skills, perseverance, and wisdom to manage your finances seamlessly. Moreover, a qualified individual will help you nurture your start-up with better decision making, minimizing your tax bills, and saving you a ton of time on administrative work. A professional accountant or bookkeeper has the capacity to change the entire dynamic of a business with better financial rulings and projections for the future. Why Hire an Accountant or Bookkeeper for a Start-Up? Hiring the right person for the job is always a challenging task for most organizations. In the beginning, entrepreneurs may feel reluctant in hiring professional accounting services as they consider them costly. However, hiring a top-notch accountant or bookkeeper can change the entire fate of a company in a very positive way. Time and time again, it always pays off in the course of a business’ journey. Since most entrepreneurs lack in depth financial knowledge and skills, it is ideal to hire professional services so that they can focus more on running their business and less on the accounting side of it. Accounting Professional—The Need of the Hour! According to studies, most start-ups fail to make their mark in their first year of business. When you examine the core of failure, you find accounting and financial inefficiencies along with poor financial management, planning, and forecasting cash flow and resources. Certain inabilities restrict organizations in managing their internal and external managerial affairs which further confines them in making an impact in the market. This indicates that cash, borrowing, and resource management have their own unique significance and must be managed professionally. Entrepreneurs may lack the financial wisdom to tackle complicated issues such as debt and tax requirements, debt repayment, filing income tax returns, managing financial books, credit accounts, etc. However, that doesn’t mean that they cannot understand and comprehend the financial standing of their company with help from a professional. 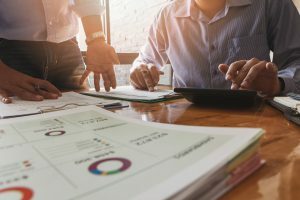 Here are few of the reasons why all entrepreneurs and business adventurists should work with an accounting professional. Whether it’s a new business start-up or an established business, the need for finding the perfect work-life balance never dies. It is the job of a professional accountant to provide you with peace by taking on certain finance-related tasks that you are less than passionate about handling. Delegating some of the responsibilities to experienced and qualified accountants is ideal for ensuring faster growth and success. Hiring a seasoned accounting professional is absolutely necessary for managing your business’s finances effectively. Entrepreneurs usually have a certain state of mind that keeps them passionate about their business, which means they will be more than excited to see their business grow at a significant rate at any cost. Businesses can only expect to grow at a massive speed if they share some of the responsibilities with specialized third-party service providers. Start-ups can only expect to grow if they keep all of their stakeholders, clients, employees, accountants, promoters, distributors, financiers,etc. happy. This indicates that building and retaining a strong relationship with your stakeholders can help you achieve success within no time. By maintaining integrity and upholding standards, an accounting professional will not only earn a name and positive rapport for themselves, but also represent your company in the best possible way. From developing a new financial perspective to providing you a safe method for saving more time and money, an accounting expert has become the need of the hour for handling core financial matter. Plus, they know the legal tricks to minimize your tax bills, which is huge in each and every sense. They help you make better financial decisions for your business which is vital to business success. An accounting professional is an ultimate game changer as they can put a business on the right track to succeed and grow.